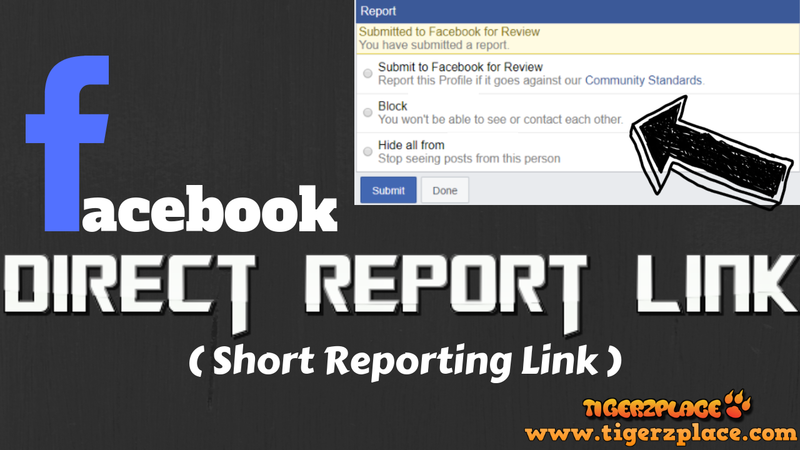 Facebook Direct Report links are a kind of short reporting links which are very easy and helpful when it comes to reporting. Now it depends why will someone need multiple reporting. For my case I usually report on fake accounts so for that single report doesn't work at all. Short Reporting Links are handy when you need to report on accounts/ groups/ or even pages on huge amount. Facebook Direct Report Links don't require all the reporting procedure to report on Facebook account. Only user need to visit that link and need to click "Submit report to Facebook"
Accounts reported in the video test are for helping purpose. All accounts/groups/pages were either faked or offensive and were meant to expose someone's privacy on social media. Users use short reporting link when they need to report on targeted account multiple times, as I said direct report link only need 2 steps (visiting and submitting). Reporter doesn't need to go through all the steps. Some users use short reporting links manually to report on that specific account with the help of friends. How??? well let say you created short reporting link then just share it with your friends or even in a group so people can visit that link and report on it, they will not need to go through all the process of reporting. For me I am making this tutorial for Facebook Auto Reporter. Anyway it's up to you how you want to use Facebook direct report link. First of all we need to change platform from normal Facebook to mbasic. Now once you change the url, you will get Facebook basic layout. Then just go through all the process of reporting. It depends why you want to report just go step by step, once you get to the last step where it says "Submit to Facebook for Review". It might be different in most cases but the point is you have to remove all the remaining url after &av= (including &av= as well). Generally &av= can be found at end of url after %7D (if you are using chrome) and if you are using Firefox then you will find &av= after "}" almost in the end of url. Once you get rid of the long string after &av= till the end, copy the remaining url and using any short link service. This link is your Facebook direct report link (short reporting link), whenever someone visit this link will get the last step of the reporting. Direct report link has changed into this. What to do? now just shor the url with goo.gl and you can then use it for multiple direct reports.